Time management (and even time warping). Being a techie, as well as getting offline as it’s so distracting. Commercial awareness – getting and delivering ROI as well as mailers, tweets and content. Technology can really help with this so I thought I’d share what I show the recruitment marketers that I mentor. I’ve blogged about this before, and I run Barclay Jones with it. Not a day goes past when I say to myself (and often out loud to my team) – what would we do without Trello? Each of our client projects is run through it as an internal project management tool. When we start working with a new client, we create a Trello board for them and work with them through it to generate lots of lovely outcomes. It massively improves communication, visibility of activities and it means that I can focus on specific clients / projects without getting overwhelmed with all of the other tech that I am surrounded by. So many of the marketers and techies I mentor suffer from option paralysis, that this system really helps with focus and delivery. There’s nothing like moving a card to ‘Done’ to give you a smile. It also works really well on mobile too! ‘nuff said by lots of others. My team (and my clients) use either Buffer Awesome or Buffer Business. £10/£50 a month to run some of your social streams is pennies and the benefits are huge. Note: Never aim for a totally free real estate of social media – you’re kidding yourself if you think your time is worthless. It’s the most precious thing you have and one of the few entities on the planet you can’t recycle! Buffer is really good on mobile too! 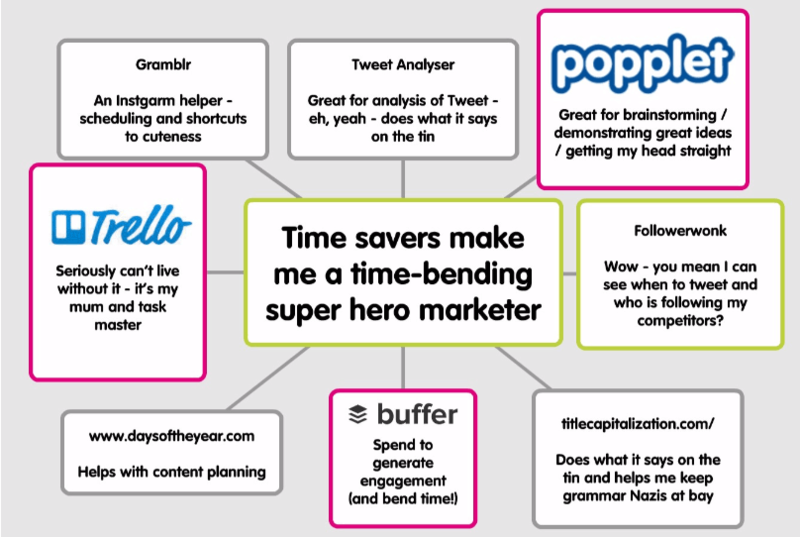 One of the marketers I work with introduced me to Popplet. Seriously, I love it. It helps me get my head straight. It’s great for brainstorming and mind mapping. It also helps me get things in to a graphic format to help with client presentations and also ideas for my own business. What tools do you rate? How do you stay organised? Let me know in the comments below!